On the Left, the Dark and Beautiful Ebony wood needles - on the right, warm and reddish brown Rosewood. 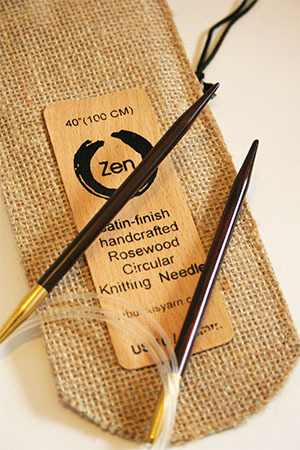 Lantern Moon Destiny Circulars in Ebony and Rosewood are often our first go-to circular needle. Why? The point. Neither to sharp or to dull, these lovely needles sneak right in under the edges of even the finest of yarns. The finish. The fabulous silken lantern moon finish makes knitting a pleasure - just the right amount of traction, not too slippery (yes, that is a problem for some of us!) and just the right length. The cable. One of the great things about the Destiny Circulars is that Lantern Moon has made it so that the cables rotate. Instead of ending up with twists and turns that fight your yarn, the cable simply swivels, and there is no torque that you need to undo when you are in the middle of a project! The woods. Last, but certainly not least, we love the woods used in these needles. The rosewood is soft and warm, the ebony a tad harder and crisper. For people who are very tactile, woods make a difference both in weight and balance, and we recommend trying both woods to see which you prefer. Destiny Rosewood or Ebony Circular knittiing Needles in 16, 26, 32 and 40 inch lengths. From sizes 4 to 17. (13,15 and 17 just in!) Beautiful Destiny circulars with their swivel capability and the fantastic finish makes for a great knitting experience. Try our ZEN Rosewood & Ebony Circulars! !